Painted in Amsterdam in 1938. In July 1937, one day before Hitler personally opened the infamous exhibition “Degenerate Art” in Munich, in which 22 of Beckmann’s works were featured, Max Beckmann and his wife left Germany for Amsterdam. His personal notebook reads: “Amsterdam 1937 from July 17. Emigré”. He would never return to the land of his birth. Beckmann had spent the previous years in Berlin and Frankfurt, which were marked by his banishment as a “cultural Bolshevik” by the Nazi-regime. His paintings were removed from German museums, some destroyed, and the artist had lost his teaching position. The following years in Dutch exile from 1937-1947 were a difficult time of isolation for Beckmann, but also a distinct period in his career. “I want to stay here for the time being, perhaps later Paris. But for now Amsterdam is not bad” he wrote to his friend Stephan Lackner a few days after his arrival in the Dutch capital, also mentioning that he would have a studio available to work in shortly. Beckmann had his belongings and artwork shipped to Amsterdam, and was soon able to continue working on previously started paintings. He was remarkably productive in Holland and created about one third of his total oeuvre there 1. Beckmann painted Am Damm (By the Dam), also entitled as Canal in Holland, in 1938. It shows a section of one of many inland waterways criss-crossing the Netherland’s mirror-flat countryside. A dark single-masted barge lies in the foreground; a smaller boat enters the picture from the left and is only partly visible. The waterway sharply bends, flowing through an enforced dike beneath a road, continuing underneath a second smaller bridge towards the horizon. At first glance the picture seems like an unremarkable snapshot of the Dutch landscape, but a second look reveals that everything in this picture is eerily out of balance. The two bridges leading over the canal and even the horizon itself aren’t straight, but slightly drop to the left. On the left shore a tall electrical pole dangerously leans towards the water, while dark scrubby trees slant into the picture from the other bank. A checkered tarp, painted in swift, thick black brushstrokes, partially covers a barren field underneath the electrical pole. Although recognizably Dutch through some of its attributes, Am Damm is not a ‘typical’ Dutch landscape in the old master tradition, which would rather emphasize the vast horizon and expansive sky over the flat land. 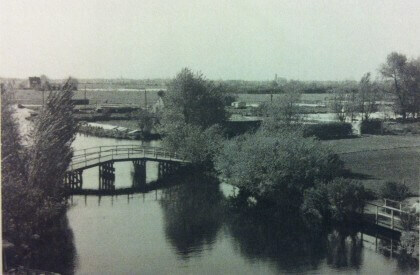 Instead, Beckmann frames the a small cut-out of a typical Dutch scenery ‒ a canal lined by green fields ‒ with the heavy, square road bridge, that along with the dark shadow it casts onto the waters’ surface, and the smaller curved bridge in the background, forms a monstrous visage with an open jaw. 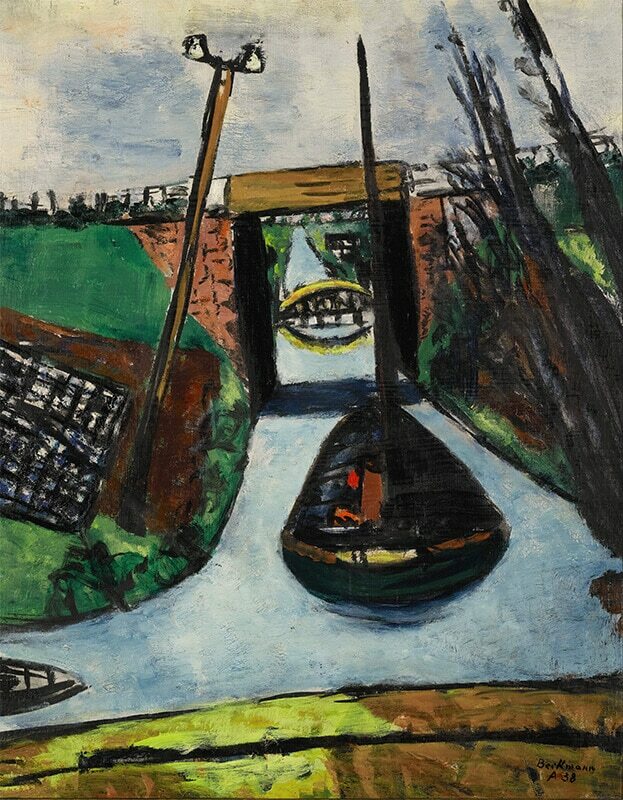 Combining actual landscape features with his personal emotions, Am Damm is a striking example of how Beckmann perceived and depicted the world around him as real and fictional at the same time. It is a picture of exceptional intensity, speaking of the traumas of exile and a looming war, as well as of the artist’s personal anguish. Beckmann’s exile in Amsterdam ended in May 1947, when his and his wife’s visa for the United States were finally approved. The couple left for St. Louis, where he was offered a teaching position, and seized the opportunity to start a new life. Am Damm likely travelled to America alongside Beckmann, where it was purchased by the artist’s close friend and most important mentor Stephan Lackner. It remained in the possession of his family until recently.